Last year, Paul Gilbert, from Manchester University Tyndall Centre, asked Elizabeth about how DEMAND was conceptualising energy. Elizabeth had no real idea how to reply. The discussion and reading (S. Functowitz and J. Ravetz, (1997) ‘The poetry of thermodynamics, Vol. 29, No. 9. pp. 791-810) that followed led us to invite Paul to give a seminar on Using the Laws of Thermodynamics to inform social science research – an engineer’s perspective. He began by introducing the laws of thermodynamics. But in brief, the first key point is that energy cannot be created or destroyed: it is the form of energy that changes. While fuel (like oil, coal) can be consumed, energy cannot. The next key point is that changes in the form of energy often limit what it can be used for next. Although energy remains unchanged in terms of quantity, it degrades in terms of quality. This degrading relates to the idea that energy systems become more ‘disorganised’. Linking these ideas together, some forms of energy have a lot of potential to do ‘useful work’. The energy available to do useful work is called exergy. If there is not much potential to do useful work then the system has high entropy. Entropy measures uncertainty/disorder and how far along the process of becoming less useful a system has travelled. This is complicated by interventions like a waterwheel. Sticking a waterwheel in a stream converts the disorganised energy in the falling water into a more organised form, capable of doing more ‘useful’ work. The bigger story here is that sociotechnical configurations represent interventions in thermodynamic systems. Second, and as we also discussed, there are intriguing and important differences in the concept of ‘useful’. From an engineering view, highly organised energy with a lot of potential to do lots of different kinds of work is ‘useful’. This never gets to the further question of useful for what??.. or to more fundamental, social issues of what is energy for? We came to this realisation quite quickly in asking why have a waterwheel at all? is it useful for grinding corn, (and if so as part of what agricultural system), or for operating industrial machinery (and if so how does it figure in capitalist development etc.). As Paul noticed from an engineering point of view, all energy conversions are equal. This is not so for social science or from an ‘anthropocentric’ view in that some are more useful in the sense of being more valued than others… and such valuing has a social history – which energy as such does not. For example, from an engineering/thermodynamic view ‘low grade heat’ is not very useful, but it can be exceptionally handy if you are cold.We then got deeper into thinking about relations between systems of energy and systems of practice: potentially dodgy territory, but definitely interesting. For example, are contemporary systems of practice increasingly dependent on highly organised forms of energy: e.g. do patterns of speed and convenience require certain concentrations of high grade ‘useful’ and ordered forms of energy. Equally important, how do contemporary systems of social practice matter for the totality of all different forms of energy and for how that is ‘structured’ in society today. (figuring out how to bound such a discussion was tricky). Other points of surprising resonance and connection had to do with the role of the individual. 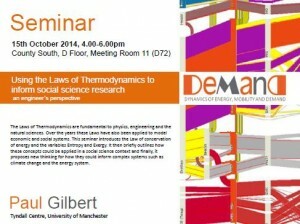 In thermodynamics, as in certain theories of social practice, the effect is to decentre individual agency. Quite how we take these insights further or where remains to be seen, but it was an excellent discussion. Apologies if I’ve got stuff wrong – see Paul’s talk for the full story.